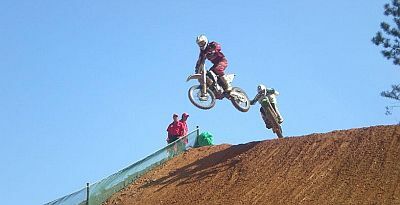 Motocross in Tenerife - where you can watch it - and try it yourself! The definition of "motocross" is the sport of racing powered motorbikes round a dirt track. Originally called "trials" and "scrambling", the eventual name came from the French "moto" and the "cross" from "cross-country". Surprisingly, the sport exists on Tenerife and opportunities exist for you to either watch professional competition - or try it yourself! Up into the hills from Las Chafiras towards San Miguel is this professional-standard motocross circuit. It was established and is run by four-times Western Australia BMX champion Jason, aided by his partner Tracey, who hails from South Africa. The track is used for professional competitions and trials throughout the year (see below), but is also open to the public, so anyone can have a go. Covering about one mile, the circuit contains long fast straights and big jumps. It is regularly watered to keep it in peak condition. You may rent a bike on a daily basis. Prices include pit set-up and support. It is required that all riders have the appropriate riding gear - boots, trousers, top, chest protection, gloves, helmet and goggles. 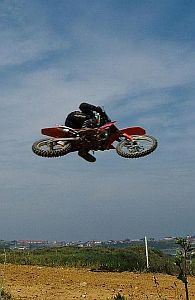 If you don't have your own, Motocross 365 can provide it all for 20 euros. It is also advised that you have adequate medical insurance for indulging in this sport. N.B. Recently, this company's website was offering it for sale. Now the website has disappeared off the Internet. Therefore, the venue may not currently be operational. The above motocross circuit is used all year round for dirt bike trials, preliminary rounds in the Spanish MX championship. All these culminate in the grand final event, the Motocross Internacional de Tenerife GoldenTyre Trophy. This occurs at the beginning of December and is usually attended by thousands of spectators. There is one open class for all categories of riders and the first day of the contest is an eliminator. On the second day, those riders who have qualified then take part in three 20 minute heats, followed by two laps of the circuit. The results are all combined to find a winner and the first five riders receive a cash prize from a pool of 100,000 euros.